2.) Sun Screen, Sun Screen, Sun Screen, Sun Screen, Sun Screen, it is never a good time if one of the kids gets to much sun. We spend a lot of time on the water and I am glad to say kids don’t have darkened skin from exposure to the sun. Keep that sunscreen on. 3.) Even though we are an outfitter by trade we insistent about all the kids under 14 putting on there life jackets before they even reach the dock. If all the kids do it the younger ones struggle less. Most fatalities are because of no life jackets. Take the worry away and stay safe. 4.) Most small kids and babies after a little struggle with the feeling of being confined in a life vest will settle down because of the activity and the hum of motor and the rocking of the water in many cases puts them to sleep. 5.) It is always a good idea to have a covering or shade. Most boats now days have bimmi tops to provide a little protection from the sun’s rays. 6.) Try to make it fun even for those that aren’t water skiing, wakeboarding or doing some of the water sports. After every few riders we stop the boat and let everyone in the boat jump in and swim around, in life vests of course. Remember stay safe, even adults can get into trouble in deep water. Our rule is that anyone on our boat the gets into that water has to be wearing a life vest. The kids sometime will have more fun with this than any activity. 7.) Take turns with the little ones so everyone has a good time. 8.) Don’t push kids or adults for that matter to do anything that they are not comfortable with. It’s not fun if they are scared, most people have to work up to it in there own way. 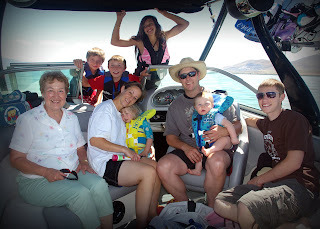 It’s not uncommon for parents to push there kids to wakeboarding, water ski or other water sports before they are ready and sometimes can create more fear of the waters. Parents, little kids can be apprehensive or dare devils some will even try to hang over the edge. Many of our rescues in our outfitting happen while little ones are sitting next to there parent.